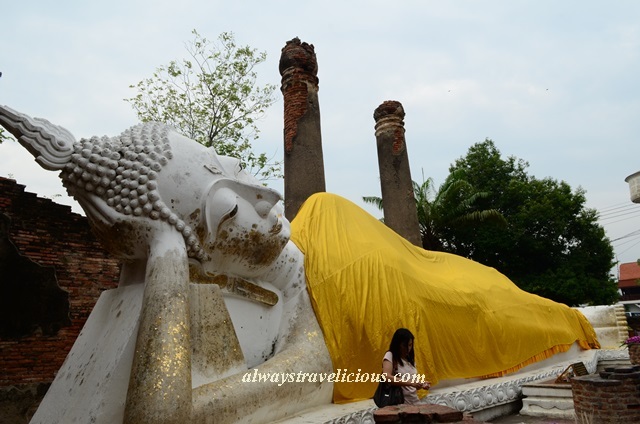 Wat Yai Chai Mongkol @ Ayutthaya, Thailand - Always Travelicious ! 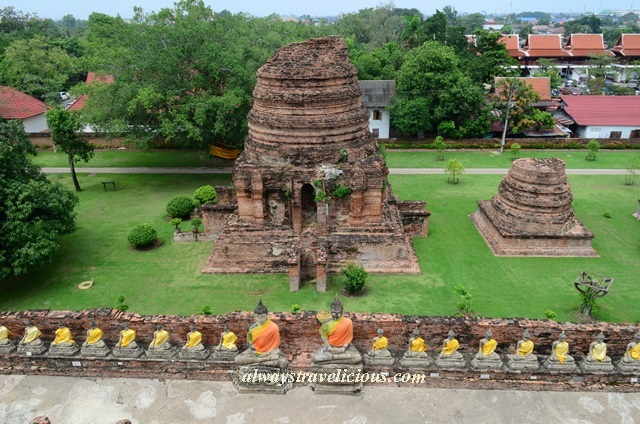 Wat Yai Chai Mongkol is an ancient royal monastery in Ayutthaya built in 1357. The monastery was destroyed by the Burmese in 1766 and only re-established again in 1957. Today, Buddhist monks still hold regular meditation sessions at the monastery. The Ubosatha Hall is the main hall of the monastery, with many worshipers and a myriad of glittering Buddha statues. The reclining Buddha’s hand and feet are popular places to place gold leaves as well. The brilliant chedi stands towering just behind the Ubosatha Hall, as if a guardian for the monastery. The chedi was only built later in 1592 by King Naresuan when he defeated the Burmese leader in a elephant duel to commemorate the victory. The chedi at 60 m tall allows visitors to climb its weathered and worn steps to take a peek into an ancient and slightly claustrophobic space. Statues of the Buddha and his disciples stand behind the chedi. Buddha statues inside the chedi are coated with gold leaves. There’s a well too – perhaps turned into a wishing-well looking at the notes and coins thrown in. The panoramic view from the chedi is sacred and peaceful, with rows and rows of Buddha statues surrounding the compound. Unlike some of the temples in Ayutthaya which are mostly in ruins with sad sights of beheaded Buddha statues, you could see intact Buddha statues draped in yellow sash at Wat Yai Chai Mongkol that transform the compound into a tranquil and placid place. I remembered this Wat, the first I visited when I went to Ayutthaya!! Hehe. This wat is famous with the trees growing around the Buddha’s head. One of the nicer Buddha heads in the area while all the others are all falling apart. Thanks for sharing. Must have been an adventure in the “golden triangle”! Cannot wait to visit this amazing country again. With everything going on in Thailand I think more people will travel to Myanmar in 2014. Found an article with more information on Myanmar’s rich history and culture: http://www.travelindochina.com/blog-articles/welcome-to-burma/ – may be useful to fellow South East Asia travellers.